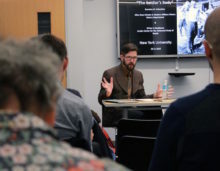 On November 29, 2016, the Jordan Center for the Advanced Study of Russia at NYU and the NYU Department of History welcomed Brandon Schechter for a talk on “The Soldier’s Body.” NYU Professor of History Yanni Kotsonis introduced Schechter, who is the Elihu Rose Scholar in Modern Military History in the NYU History Department and a Writer in Residence at the Jordan Center. The speaker shared the first chapter of his book manuscript, Government Issue: The Material Culture of the Red Army 1941-1945, which uses everyday objects to tell the story of the Great Patriotic War. Schechter first spoke about his decision to focus on objects. “What are things going to tell us that other types of inquiry might not?” he asked. “I think in general, there is not enough attention paid to objects, particularly in this period of Soviet history,” as well as the history of the war in general, he said. “Guns, bread, uniforms are the medium by which the state gives the soldiers things to defend [the state]. It makes material the soldier-state relationship.” The Soviet state’s command socialist economy used the distribution of objects as a form of rule—not because the government produced these objects, but because the state controlled them, Schechter emphasized. He then discussed the soldiers as objects themselves. “It’s common to think of soldiers as part of a massive machine, that is, the army,” Schechter said. Even Stalin called them the “little cogs of history.” What’s more, during World War II, deputies had almost total control over their soldiers, who called their superiors khozyain, an old title that Russian serfs used to call their landlords. Schechter then turned to a discussion of the demographics of the Red Army, splitting the population into five cohorts: those who were suitable for combat positions, those who were suitable for non-combat tasks, those who were outright unsuitable, those who were trained and those who were untrained. The ideal soldier, he said, “is Slavic, urban, at least has a secondary education and is a member of the Komsomol,” but at the time, the Soviet Union had an overwhelmingly rural society, and education levels were relatively low. Ideals were soon conquered by the fundamental need for more soldiers—over the course of the war, the army was rebuilt five times, and massive casualties drew kulaks, déclassé elements, children of the “enemies of the people,” and even criminals into the ranks. Nerusskiy, a blanket term for non-Russian speakers, reemerged in 1942 as the army grew more diverse. Because these soldiers did not understand Russian commands, many deserted or suffered casualties. But by 1943, once draft training incorporated education and wartime propaganda began to be printed in other languages of the Soviet Union, the multilingual army grew more effective. One of the unifying aspects of participating in the Red Army was that “who you were before the war could have dramatic or no impact on who you were in the army. Induction was always a very sharp break with your past,” Schechter said. The Red Army also leveled the class system —“wartime propaganda plays down class, playing up deeds at the front,” Schechter said, adding that because there was little to no documentation, many soldiers “reinvent[ed] themselves as much as possible.” Still, soldiers from rural areas were more likely to end up in the infantry, as opposed to the more technical branches with a lower mortality rate that were reserved for higher classes. Schechter next touched on various challenges to the disciplinary regime under Stalin, who, by 1941, supposed that “discipline should be higher, strong, and more severe in a classless society,” Schechter said. “We often think of the Stalin regime as a militarized society, but that is different from the army [where] you’re dealing with an individual who has a gun and can order you across minefield and can shoot you for not doing it,” Schechter said. Soldiers were not allowed to leave or help others on the battlefield, and they were instructed to fight as much as possible, even in retreat. Families lost benefits if a soldier were taken prisoner and property was confiscated if a soldier deserted. Still, many soldiers thought this discipline unnatural and circumvented this regime by finding “ways to use their bodies in ways the state didn’t want them to,” Schechter said. Self-injury, surrender and desertion became an epidemic by 1942. While commanders surveilled their troops heavily and had no reservations executing soldiers, “a disciplinary regime can only function if the army can control its soldiers,” Schechter said. In the Q&A session that followed, Schechter expanded on some specifics about the Soviet military regime. In response to NYU Professor of History Jane Burbank’s question about the impact of the circulation of soldiers in the army on morale, Schechter noted that commanders were “really just much more interested in servicing people at the higher end of the hierarchy than they are in servicing everybody” and that while soldiers moving from unit to unit was exceptional, he had yet to read any complaints from those who served in the army. Anne Lounsbery, Professor of Russian and Slavic Studies at NYU, inquired as to what practices in the Russian imperial army carried into the Soviet period. Schechter said that continuity was minimal in 1941, but that “by 1943, the Red Army is basically viewing itself, presenting itself as the inheritor of all the good things of the imperial period,” awarding medals and other honors and looking at 19th-century military etiquette manuals. Even the term “officer” came back in vogue by 1943, replacing kommandiry. However, he mentioned that the dispersion of soldiers among various units did not reflect an imperial tradition. In regards to the women’s place in the Red Army, Schechter noted the “tension between the centrality of warfare and the every day of war.” On one hand, women were mothers in a “pronatalist state that realizes [it’s] facing a demographic crisis,” but on the other, the army was simply in need of soldiers, and women could help to fill some positions. A woman could leave to give birth, but at one point, pregnancy was “no longer a one-way ticket,” and mothers were required to return to the ranks. Still, “virtually no women were allowed to stay in the army after the war” and they were the first to demobilize, Schechter said.